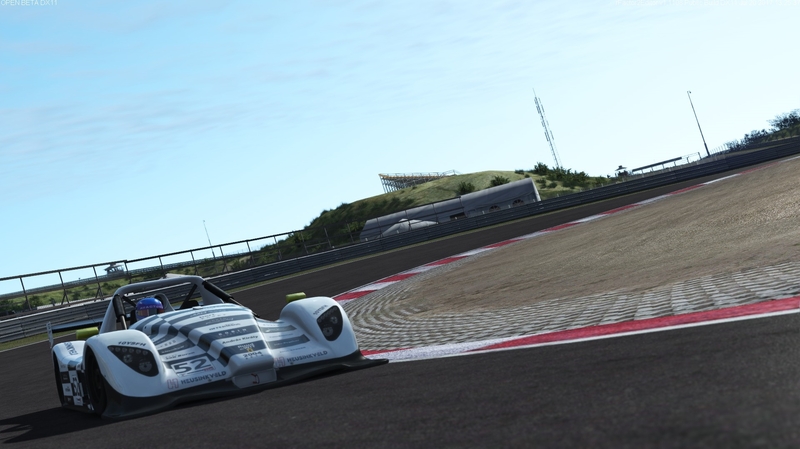 Studio 397 has put out their latest edition of their rFactor 2 Road Map update, showing off what they are working on for the month of July. One of the main developments is the preparation ahead of McLaren’s World’s Fastest Gamer competition, which is slated for next month. It was fairly obvious that we would be getting a McLaren car for rFactor 2 before the competition began, and now we officially know what car we’re getting, the McLaren 650S GT3! The car will be available at the “start of August” as a paid DLC content, and will also be part of a larger pack. It’s not mentioned if the content can be bought either a la carte, or just in a pack, but either way, I’d say it should be reasonably priced. 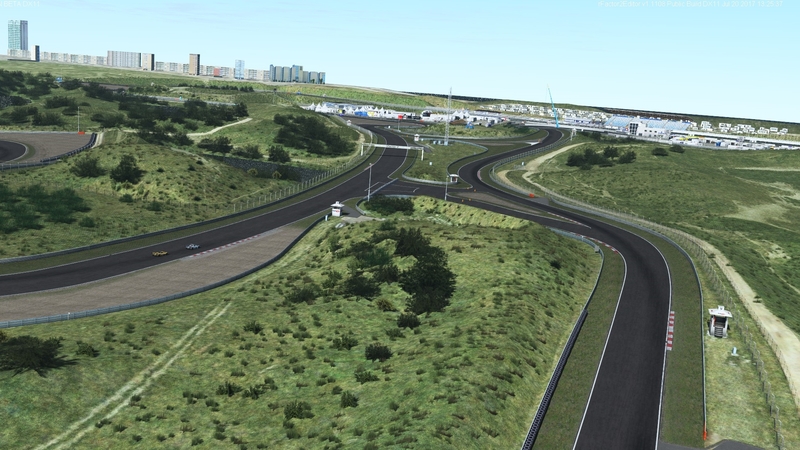 In addition, we have more previews of Zandvoort, which will be the track used in the second round of the McLaren World’s Fastest Gamer competition. Unlike the McLaren, Zandvoort will be released as FREE DLC! We had seen previews of the track earlier on, but this is the best look we’ve had so far! The track will release (obviously) before the race on August 20th, so stay tuned for that. 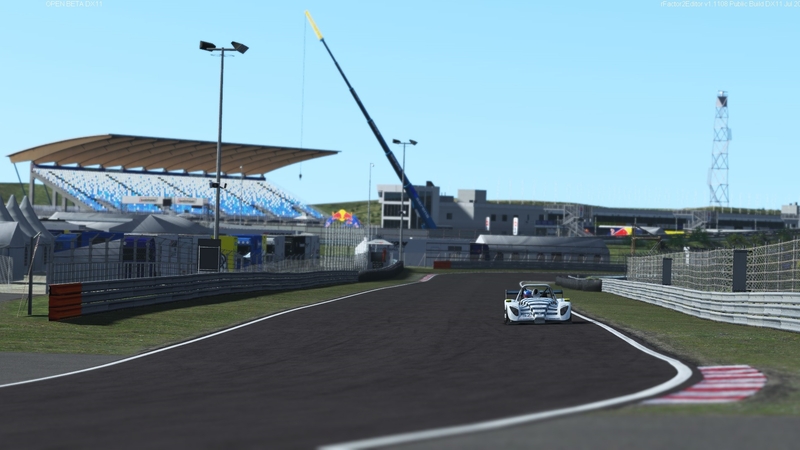 For more information about what’s in development for rFactor 2, including the new UI, ranking-based Online system, and more, I recommend you read the full info below. As we’re counting down to the start of the McLaren World’s Fastest Gamer rFactor 2 competition, it is time for another roadmap update! We have so much underway at the moment in many areas, however, we are not quite ready to show it all. As we previously announced, McLaren’s World’s Fastest Gamer starts soon, and we are really excited that rFactor 2 was chosen as the flagship qualifying platform. This competition aligns with the overall competition structure that we are currently building, allowing tournament style events that extend all the way to a license progression system. Our competition platform will be unique in many ways: we will have our own structured competition and, in addition, support the community. We actively believe in the strength of our community to run outstanding events, both online and onsite. Specifically, APIs will be made available to allow sanctioned leagues/competitions to integrate with our overall structure, providing visibility and consistency. We are also developing our license structure based on an overall percentage rating and a system that penalizes drivers for off-track or bad driving by giving time penalties instead of relying on an independent safety rating. We have some even more exciting news: it’s no secret that we are releasing a McLaren GT car. And now, we are pleased to announce that it will be….drum roll please… the awesome McLaren 650s GT3! This McLaren will be used in the World’s Fastest Gamer competition and will be available for you all as a paid item in our upcoming item store at the start of August. We’re really excited to launch with this car, which was developed in close cooperation with McLaren. But that’s not all! 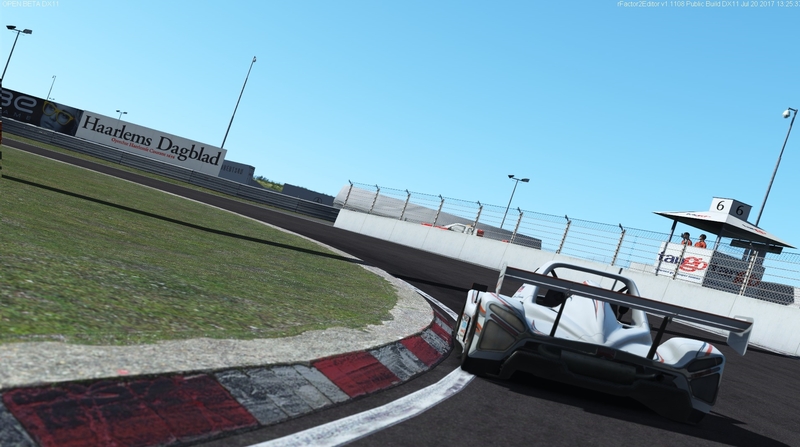 This car will also be part of a soon-to-be-released wider pack, reaffirming our ambition to align our content! What a tease! Many of you saw our rendition of Zandvoort at the Max Verstappen days. Since then, we have optimised and further enhanced the track. Like the McLaren above, Zandvoort will be used in the World’s Fastest Gamer competition and will be released as a free addition. Check out some screens below! Additionally, we are working on some new significant track projects and will share more in the next couple of months. Ever since the beginning of the year, we’ve showed you the evolution of our DX11 graphics engine. Right now, we’re close to the point where we are happy enough with the visuals and performance of this engine to soon switch it to become the default. We will keep the DX9 engine around as an option for a little while longer, at least until we’ve rolled out the new overlays (see below). This also does not mean we are done developing the engine. We still have many bigger and smaller improvements to make it look better, and we will keep pushing those out in the upcoming months. At this point, we would also like to thank everybody who actively participated in our open beta. Your input was very helpful and allowed us to improve the whole engine, and VR mode, a lot quicker and better. Not only are we putting the final touches on our in-game user interface, as you have read above, we are also about to roll out the first parts of the new competition infrastructure, which will fit right in with the new UI. To show you some of the last details we are currently working on, we’ve captured two details of the UI, starting with the calibration screen for your wheel and pedals. As you know, you could always calibrate axes visually, but when specifying the ranges of motion and the deadzones, you had to physically move your wheel or pedal in the right position to set such a limit. Now we’ve included not only the exact numbers, but you can also directly edit them to fine tune them exactly the way you want without having to mess around with text files. A second detail we’d like to show is what we’ve done with the garage setup screens. There was already a way to compare, and we made that a bit smarter, but we also added a quick way for you to see what changes you made to the current setup compared with the one you saved last. 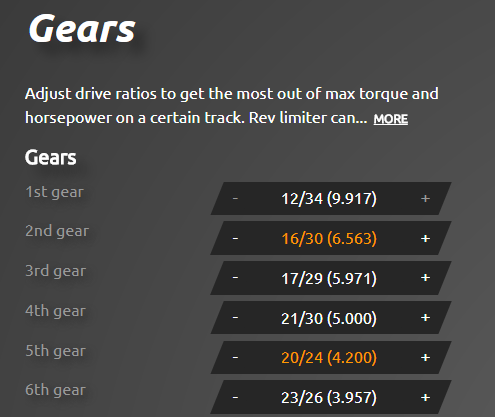 In the shot, you see two gear ratios that have an orange font. Those are ratios you’ve changed. That way you can quickly get an overview. It’s little things like this we are still tweaking. We know it’s taking a bit longer than you, and we, anticipated, but the wait is almost over! One of the things we have been working on over the last few months is our tyre model. You may have noticed some changes in the latest version of the Radical, and you will also see them in the upcoming McLaren. These updates reflect our work on improving accurate tyre fidelity. We have a number of tyre updates underway, making one of the best tyre models in consumer racing simulation even better. We have been working hard to create a solution for overlays. As you know, we aren’t great fans of rendering over rFactor 2 screens as this can cause issues that become hard for us to resolve. We have built a solution using HTML. Shortly, we will be allowing 3rd parties to develop their own overlays, not just for broadcast, but for in-game HUDS through an API. For those of you who don’t know, this year’s Sim Expo will be held on the 16/17th September at Nurburgring – another great chance for all of sim racing to come together. We will be there, of course, showcasing some cool future features and content, so make sure you pop by! Previous articlePorsche Coming to RaceRoom!